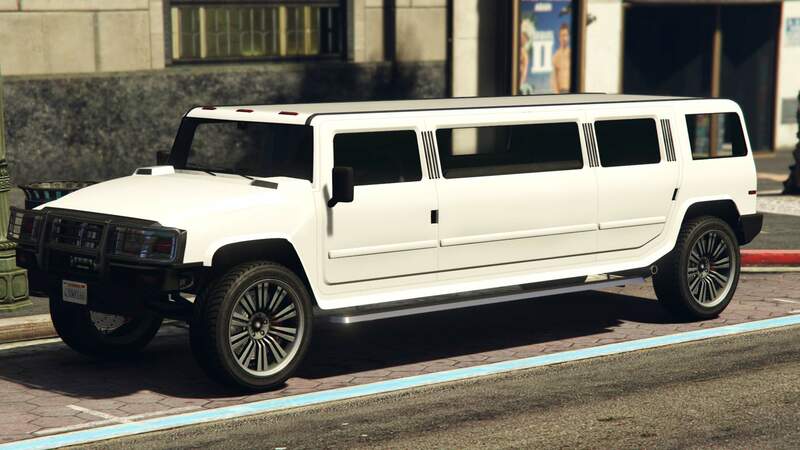 Not the biggest, but probably most confusing mechanics-wise update in GTA 5. Only the info you need. First of all, about their "normal" functions. And there isn't much really. 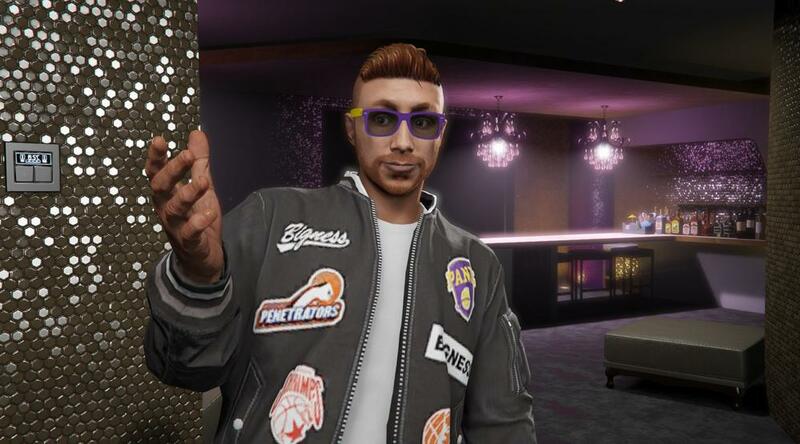 You can set entrance price for other players, style of NPC's clothes, remove NPCs except staff completly (Private Club option), set who of players can access your club. 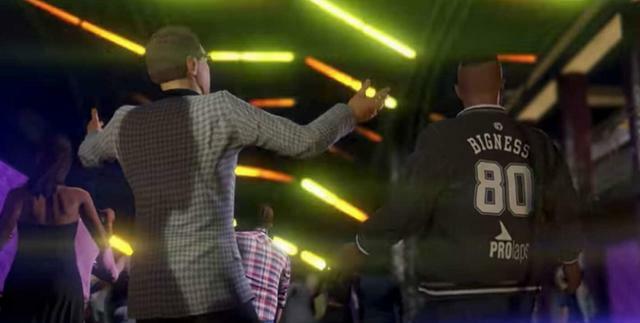 You can dance at any place within any nightclub which is pretty fun and they even added 4 dance-related awards such as "Dance for 5 mins without skipping a beat". Your Club management PC is located at the very back, I recommend entering through garage to save time. 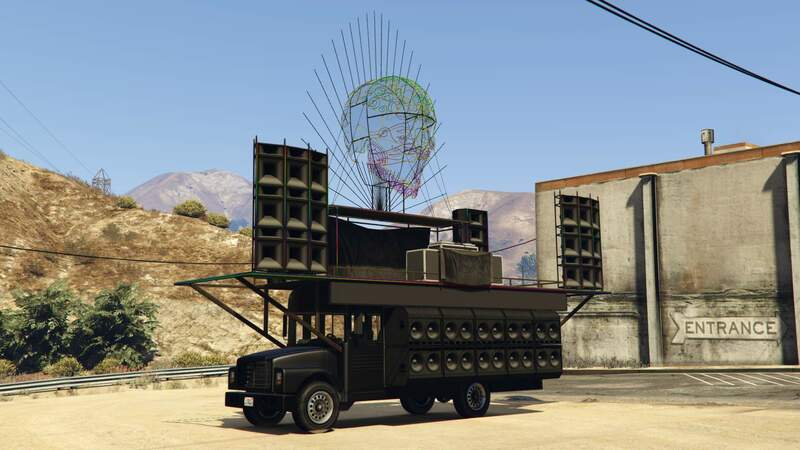 Nightclub comes by default with 1 level of storage (more on that in Business paragraph) and a specialized garage for Speedo (which also goes with the club), Mule and Pounder Customs. You can also put any single car in the back of your nightclub itself. Most important yet not necessary upgrades during purchase are 4 levels of storage and 3 10-car garages and that's about it. Rest is cosmetic. However, you have 3 other options, similair to Bunker, which are acessible from your PC only when you have your nightclub running already. These are Equipment (Faster accruing of goods), Personnel (Popularity loss is slower) and Security (Unknown yet, probably to decrease raid chance similair to MC). If you don't have any other facilites and expect this one to give you enough income, don't buy it. 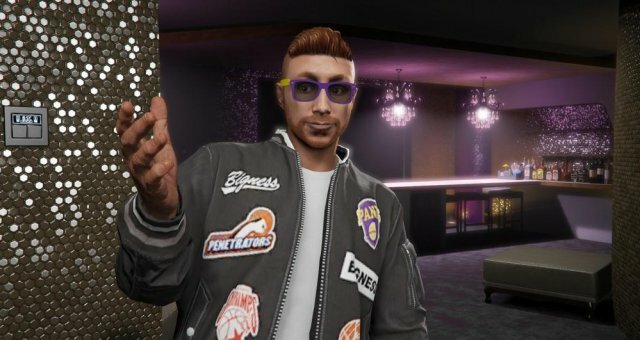 Nightclub alone will be enough only to cover your daily fees with maximum daily (in-game) profit of 10k at maximum popularity. You will need to collect that money personally from your safe in the club. And to keep maximum popularity you'll have to run ~5 minutes promotion missions which will not be explained due to be very straightforward. So if you're thinking of getting it as 1st or 2nd facility, don't. As an addition to other business it becomes more interesting. The mechanic here is following: you need to own facilities from previous updates to get access to accruing different types of goods from your nightclub. However, you need people to do that for you. In the nightclub PC's management tab. They cost from ~150k to ~300k to get. The cool thing about them, they won't increase your utility charges and will get product from businesses even if you don't have supplies there. So the income is as passive as it gets. And here're the profits you can get for the goods. Equipment upgrade or any facility upgrades DO NOT increase stock value (speed increase still unknown). And to get more product space, you need to upgrade nightclub's storage; by default it has only 20% of maximum and each level adds another 20%. Numbers shown below are for maxed storage. Printing & Copying = 1000$ / 15 mins; max 60 (Forged Documents). Organic Produce = 1500$ / 20 mins; max 80 (Weed Farm). Cash Creation = 3500$ / 30 mins; max 40 (Cash Factory). Pharmaceutical Research = 8500$ / 60 mins; max 20 (Meth Lab). South American Imports = 20000$ / 120 mins; max 10 (Cocain Lockup). Sporting Goods = 7500$ / 60 mins; max 100 (Bunker). Cargo and Shipments = 10000$ / 70 mins; max 50 (Hangar). I made the calculations for you, and with most profitable businesses active that'll be 41.6k$ / hour. That is obviously a tiny amount, but you since you don't need to anything to get it, it's kinda reasonable. And a pro-tip here: stay registered as MC Pres as little as possible to avoid daily fees for your businesses. Works like with bunker, but different numbers. You need to be inactive (freeroam, not involved in any missions) for 4 hours and have more than 20% of available stock stored for the game to trigger raids. Security upgrade straight up doubles those numbers. They added new features here compared to warehouses. Those are "bundle" sales which require having select amount of product stored, eg 10 crates + 15 Cash + 3 Coke. They do give bonus money, up to around 25%. Or you can just sell any amount normally without any bonuses. And, just like with Hangars, Tony will take 10% of your base cut. If you're selling in public, your High Demand bonus will be calculated from base price. And it goes without saying, you can sell only in public sessions (solo pub works). 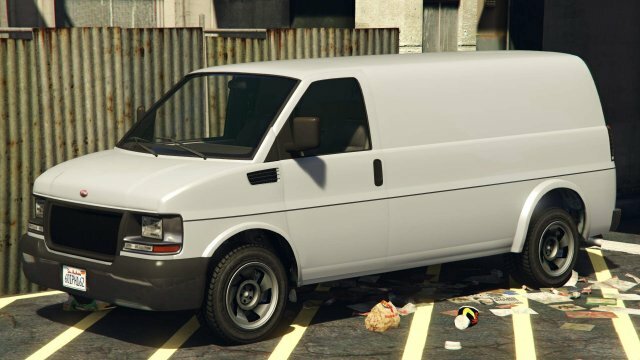 The selling will be done using those vans from special part of your garage so I recommend upgrading them, especially armor. Upgrades are not that expensive and don't really improve your survivability in freeroam BUT they do during these sales. And hey, they also look great fully armored. For selling < 90 crates Speedo Custom is used, 90-180 - Mule C, > 180 - Pounder C.
I do not recommend selling 90+ at once currently due to an oversight by R. You might get a mission which requires the truck to be lifted by a Cargobob, however the heli is physically unable to lift them. If you end up in this situation, forcequit the game by killing gtav.exe in task manager. I felt like this yet unreleased vehicle deserves a paragraph for itself since it has plenty of features. It is basically an alternative of MOC with different equipment. First of all, it is a single trunk without a trailer. Secondly, instead of turrets it has a Missle Station similair to Chernobog and it is rumored to be able to lock onto multiple targets at once. Thirdly, you can put a Drone Station on it. It is known that drones can fly about 750m away from your truck, they are equipped with tazers and they can be shot down. Fourthly, you can launch all kinds of resupply missions from it. 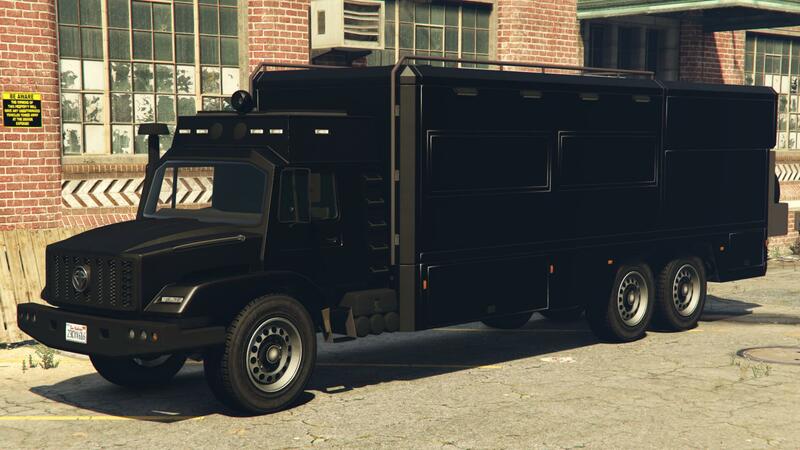 That includes, MC supplies, gunrunning supplies, vehicle cargo, special cargo, airfreight cargo. Fifthly, it has an option to put a weapon workshop which happens to be the only place where Oppressor MK2 can be upgraded. And, just like with MOC there're some new jobs that can be started exclusively from it. Note: Armor - how many RPG projectiles will take it to destroy the vehicle. Controls - More powerful version of Speedo, with plenty of wheelspin. Overall quite good. 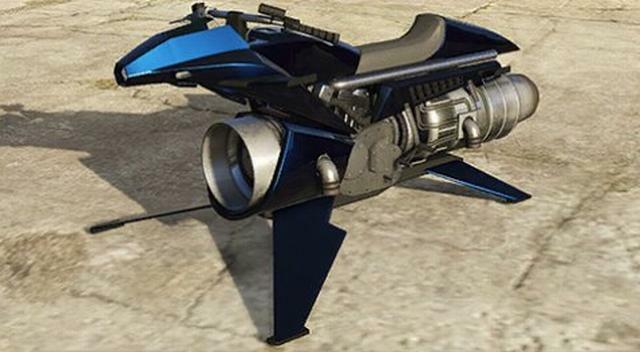 Weapons & Upgrades - Proxy mine; Forward-mounted machinegun, Remote .50 cal (from insurgent) or Remote Minigun (from Turret Limo). Armor - 1 (3+ during business sale with upgrades). Opinion - Quirky little van good enough to pick on light-armored vehicles. It is free and with some upgrades becomes a good all-purpose vehicle. Controls - Just like the Speedo, default Mule on light steroids. Weapons & Upgrades - Proxy mine; Forward-mounted machineguns or missles; Remote Grenade launcher for passenger. Opinion - Weaponary set it quite odd and you won't likely be able to kill anyone or even defend yourself with ease. Not my choice of the truck really. Controls - Heaviest of the bunch, lots of ram power and wheelspin. You won't be able to start moving on an ~15 deg incline without throttle control (possible only with controller) so keep that in mind. Weapons & Upgrades - Proxy mine; Forward-mounted machineguns or missles OR Remote Missle Turret; Remote Grenade launcher for passenger. Opinion - Cheap, fun traffic plower, its ultimate weapon choice (Turret) can't aim more lower than 0 degrees (parallel to X axis, not the vehicle itself) doesn't allow to use this truck to its maximum. Controls - less maneuvrable than Lazer or Hydra. Rather slow on low altitudes (<1000 feet), but can reach whooping 230 mp/h above 1k feet. Weapons & Upgrades - optional Bombs; by default comes with Explosive cannon similair to Rogue (less AoE damage compared to Lazer), Homing and Barrage missiles similair to Hunter. 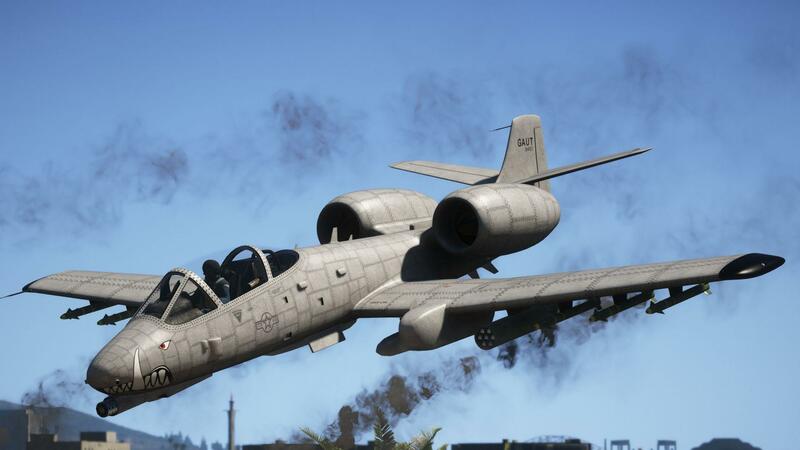 Opinion - middle grounds between old-gen and new-gen jets. Will work the best against ground targets, but don't expect to win against Pyros in it. Controls - think Deluxo. Reaches 127 mp/h while hovering above ground and 87 in air. There's a "Vortex Engine" upgrade that makes you lose altitude slower as the bike is noticably affected by gravity. Opinion - I don't know what to say yet, but I guess it won't be much of a trouble dealing with these considering their maneuvrability. Opinion - another "fused" vehicle that wants to be everything. Will it succeed? Probably. Controls - very similair to Insurgent. Weapons & Upgrades - also similair to Insurgent, default .50 cal or 3-barrel machinegun. Also has fixed machineguns to offer that seem to be more powerful than on the rest of the vehicles, but nowhere close to the ones on Stromberg. 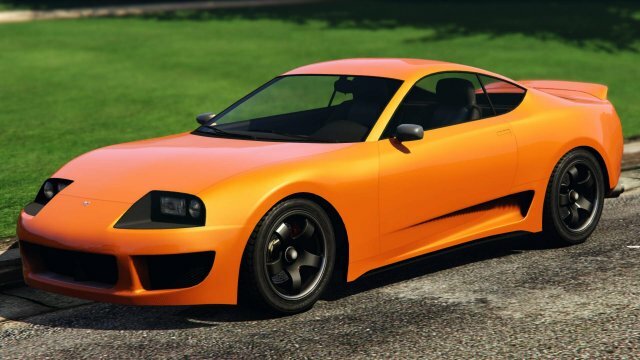 Opinion - and another mix of vehicles, however this one loses compared to it's older brother, Insurgent. Controls - Long 1st gear, incredibly high top speed and extremely unstable on bumps. Best for flat roads. Customization - Racing liveries, period-correct trunk/frunk mods and a few grille options. Opinion - Relatively cheap recreation of one-off Jaguar Xj13, perfect for collectors, questionable racing choice. Controls - Somewhat average, nothing interesting. Customization - Plenty of bumpers and spoiler, various liveries. Opinion - A weeb's dream that will be overrated as it is. Controls - Similair to normal Patriot, except it's long. Don't expect to climb mountains with it. 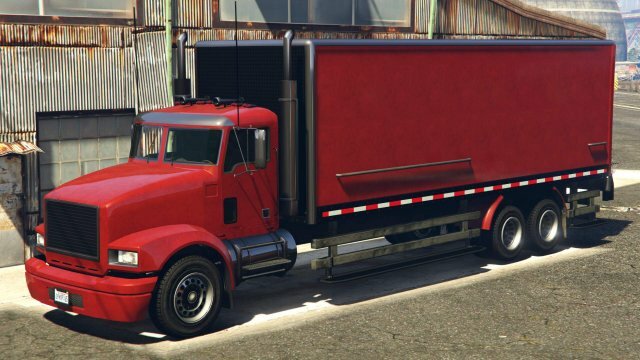 Customization - A few hood options (mostly recolor), bumpers recolor and exhausts. Opinion - A niche thing, recommended only for those who have friends. Controls - A copy of Prison bus, feels exactly like it. Customization - being a Pegasus vehicle, it has nothing except for a few liveries where you can choose only one during purchase. 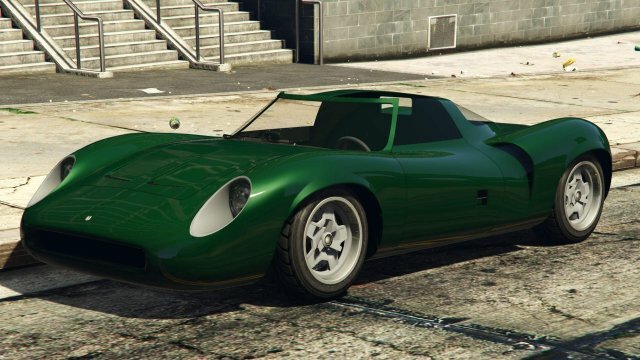 Opinion - oddball vehicle, purely for fun with friends if you have 1.4M free. Controls - old and heavy as you expect it to be. Customization - only liveries including UK flag, psychedelic/hippy themed and rust. 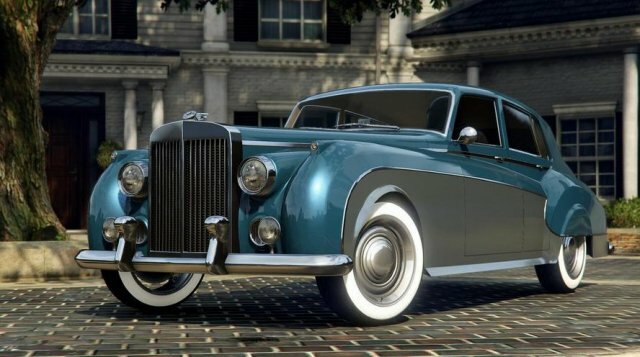 Opinion - purely collectible luxurious vintage Rolls Royce. Looks stunning. Controls - above average performance, but tends to flip on actual offroad due to high center of gravity. Customization - a bunch of offroad-theme mods, 8 liveries. Opinion - a very unique looking jeep, doesn't cost much so you might just buy and test it yourself. Changes, tips and tricks worth mentioning. Removed default livery from Futo. 8 new dance actions and 1 new walk style have been added. 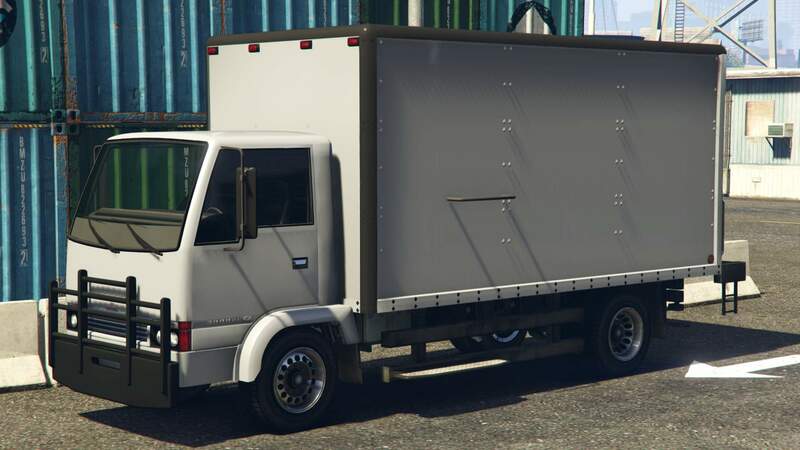 Most of freeroam events got disabled in favor of "Business Battles" which require you to steal a cargo vehicle and deliver it to your nightclub. You might get some exclusive Epsilon clothes if you pass out from Macbeth. Only works in the bottom bar. 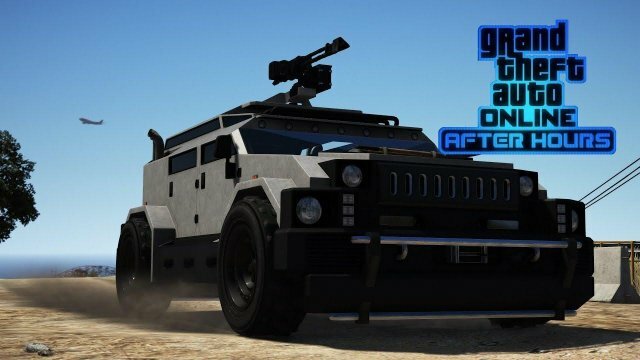 In addition to that, a bunch of all vehicles will become purchasable. 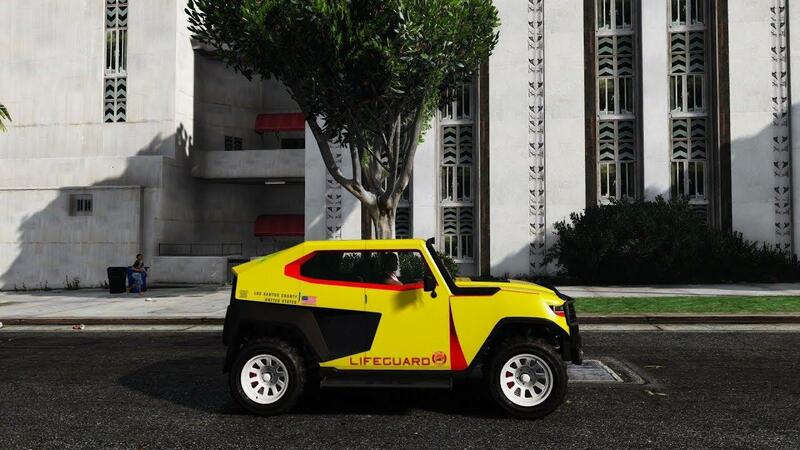 Some of them will get 10 liveries each (marked with *) and some will even get new mod parts (marked with #). 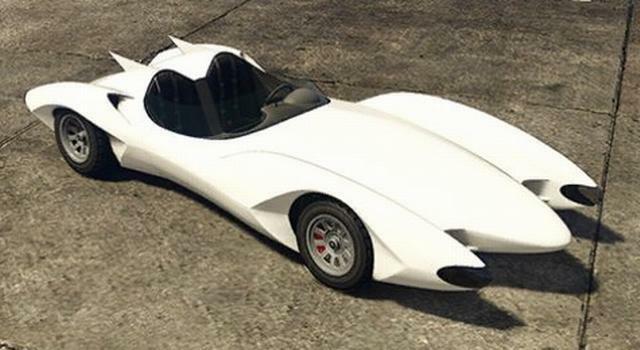 Coquette Classic, Mamba and Penumbra can already be bought, but will also get liveries.